Hudson Bay showing the arcs of the bay. It is possible to draw four large round circles in Hudson Bay. The largest scales to a diameter of 400 miles. The second largest scales to 230 miles. Hudson Bay is very shallow. Yet it was once compressed down 900 feet deeper than it is by the mass of the former ice sheet. The large appendage to the bay in the south is extremely shallow. References differ on the bay’s depth from 111 feet deep in the east to 768 to the northwest. Variations aside, this is a very shallow body of water when the size of it is considered. This causes a problem if one wants to prove these are large craters. They are just not deep enough to be craters of this diametrical proportion. For example, Barringer Crater, Arizona is 4000 feet wide and 570 feet deep. Look at the other contraindications. Besides its shallowness, there is no impact ejecta. There may be central uplift in the bay as islands but for the size of it, and the age as required to have brought about the end of the “ice age”, there is no deep basin. There is no high well delineated edge as can be seen in the Pingualuit crater which is supposed to be vastly old by comparison. It does not seem possible that this is a crater. Yet it can be argued that it is. Formation of a crater within the two mile thick ice sheet that once overlaid Canada which resulted in Hudson Bay. So, how does one explain Hudson Bay is a very recent comet crater 1000 miles by 300 to 400 miles across? Once again, let us just look at what we have. We have a nearly perfect arc in an area that is on average 330 feet deep. This same area was once overlain by an ice sheet two miles thick in certain parts. Two miles thick is 10,560 feet of hard frozen, compacted, heavy ice. This means that if we took a cross section of Hudson Bay when the ice sheet was there and scooped a crater out of it that only dips into the ground 330 feet, the crater was theoretically 10,890 feet deep with little imagination. The bottom of the crater only remains then as the Nastapoka Arc which implies the upper rim, now long melted, was substantially larger in diameter. The ejecta was simply ice, and billions of tons of it which was spewed as far as Siberia to engulf herds of grazing mammoths. It was thrown as far as Scandinavia to leave glaciers there. There was no dust cloud that enveloped the Earth for decades, because water does not create dust. It creates rain. The elongated shape from the northwest to southeast then is either the sideways impact of a comet striking the surface at an angle or the successive impact of several portions of one comet. A sideways impact will add more torque to the reaction of the Earth and aid in turning the outer layers of the planet. The enumerable other craters that dot the northern latitudes may have occurred at the same time or during later events which totally negates their vast ages. 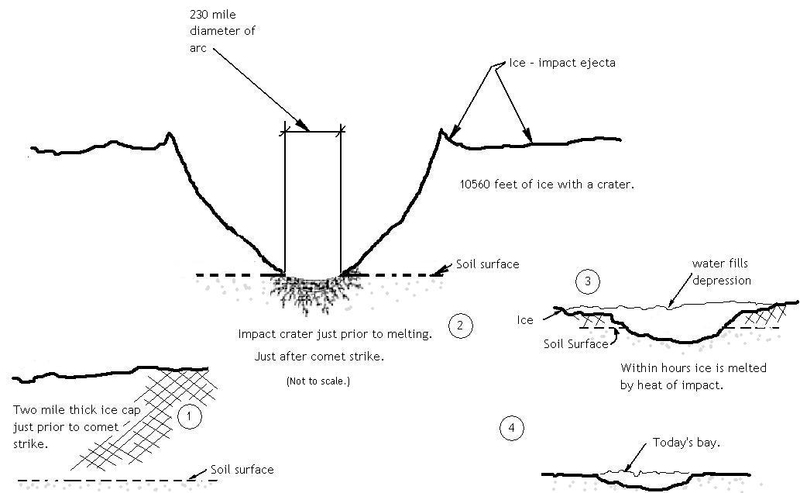 Successive crater formation as comet strikes Ice Sheet (future bay area) and blast material ricochet to form other impact sites. The picture becomes clearer when we comprehend the velocity with which these mammoth projectiles struck the planet. They could not just strike and stick like an arrow in a target. They shattered on impact and bounced in very much the same manner as a stone skips across a lake, except in this case their velocity was unimaginably high. We see directly below Hudson Bay the five great lakes and upon close inspection we see several sections of each lake exhibit the same round cut out pattern as the Nastapoka Arc of Hudson Bay. 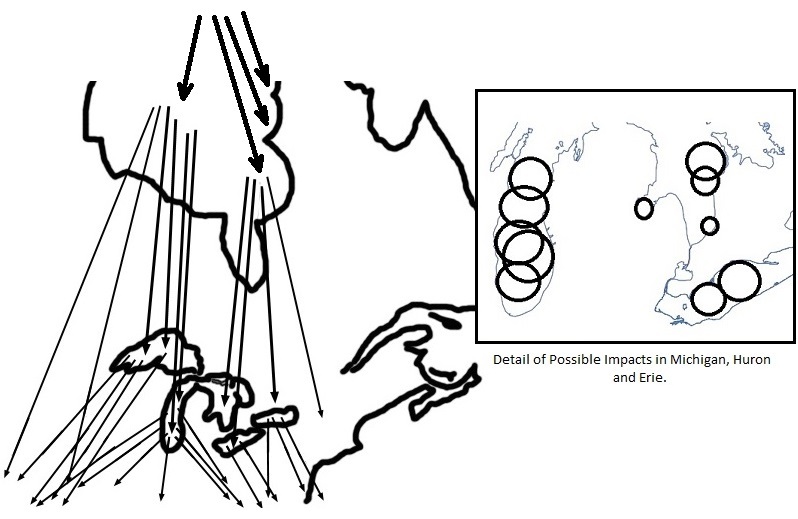 Once impacting and forming the Great Lakes the debris shattered even further. A rebound impact could not entirely expend the comets’ energy. The debris kept moving albeit at a slower yet still extremely high velocity. It fanned out to the west, southwest, south, east and southeast blanketing and smashing millions of square miles. The impacting debris formed what are called Carolina Bays. The name originates from the thousands of long elliptical, shallow structures that appear throughout the Carolinas. As Kelly and Dachille explained in 1953, they were formed by massive melting icebergs. In other words, they were debris from the shattered ice cap. Overlapping polar circles creates a vesica shape where the thickest ice on the planet is found. Indeed, almost the entire old polar ice cap was displaced from the bitter cold of the Arctic Circle. The ice that was outside the first circle was now -outside of the arctic circle- and prone to melting. We call these areas glaciers and their melting is what we call the ‘End of the Ice Age.’ It is proposed that the glaciers extended into Ohio, not because the weather patterns had changed allowing the Earth to cool but because this area was within the Arctic Circle when the ice formed. During this same period of time, half of Antarctica was dry land and ice free because it was outside the Antarctic Circle. The Earth had gone through a long period of stability and created these extremely large and thick ice layers at the then poles within the first circle. The sea level had dropped and man had happily moved out onto the vast plains left behind by the receding ocean. It was safe. It was beautiful and they were blessed, for a long while. Continue reading …..full article posted here. Possible remnants of the comet are seen in the next post. This entry was posted in American History, Ancient History, Mysteries, Science, Uncategorized and tagged Baal, Comet Impact, geology of Earth, Hudson Bay crater, recent comet craters. I believe you are correct in that the Bay is a result of many impacts as a large body broke up. But the black mat layer found by archaeologists throughout North America suggests this matter came from somewhere and the most likely source is the comet(s) that formed the bay. The hundreds of tons of copper in the Michigan area also must have a source. Wittke, James H. (20 May 2013). “Evidence for deposition of 10 million tonnes of impact spherules across four continents 12,800 y ago” (PDF). Proceedings of the National Academy of Sciences. 110: E2088–E2097. I proposed an alternative theory of the origin of the Nastapoka arc and other related phenomena in my book, An Earth Shattering Theory about the Moon – Speculations on Planetary Land Forms.